At 28 years old, and almost 1900 career carries, there is some worry that time could be running out on McCoy. While it can happen fast, there is no indication that he is slowing down. He’s had over 1200 yards in three of the last four seasons. Injuries are always an issue for running backs, and McCoy has had a few. But he was great in 2016, and the offensive line knows how to open up the right kind of holes for McCoy’s style. He remains one of the most creative and electric backs in the NFL. 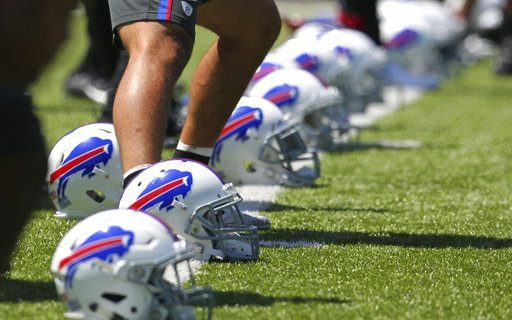 If that continues, the Bills will once again be one of the best running teams in the league. When they use a fullback, the Bills swapped Jerome Felton for Patrick DiMarco. Fullbacks are fullbacks in my eyes. Maybe DiMarco can catch a few more balls or run a bit on short yardage. Don’t count on it. He’s there to block when the Bills decide to use a two-back set. Tolbert is more interesting. He’s a much more accomplished runner and receiver. While listed as a fullback, I would not expect Tolbert to do too much lead blocking. Short yardage, goal line, short passes, special teams and leadership are the reasons why Sean McDermott brought him here. The backup tailback spot belongs to Williams right now. Highly touted after a big career in the SEC, Williams missed 2015 in college and barely played last year as a rookie. Fumbling is an issue, both in games and practice. If he solves that, Williams will get the chance to win the #2 job. If not, look for the Bills to bring in a veteran back like a Rashad Jennings or a James Starks to be a reliable option if anything happens to McCoy. As we saw with Mike Gillislee last year, the offense and line are good enough to make any backup successful. The group of other backs: Banyard, O’Neal and Johnson may have a shot at the #3 spot with a big camp and preseason. More likely, one will wind up on the practice squad. I would not be surprised if the Bills only keep four, with Tolbert taking the role of #2 fullback and #3 tailback. Overall, this is a position of strength if McCoy stays healthy and continues to play like he did last year. In my mind, this one of the few positions that are safe and sold and without worry.